If you’re looking for a medical alert, this site helps you find the right one. No hype. No false promises. Just good advice. If you’re feeling confused by medical alerts, you’re not alone. Companies push the benefits of their systems without mentioning any drawbacks. Review sites nudge you toward the companies that pay the highest commissions. You’re left trying to sort through all the competing claims to make sense of it all. This site walks you through the process of finding a medical alert that’s right for you. First, let’s cover the basics of medical alert systems and companies. Then we’ll go on to narrowing down the choice. First, it lets you call for help when you can’t reach a phone. Second, most connect you with a trained responder who can connect you to the help you need — neighbor, adult child, ambulance. The alternative to having a medical alert is to carry your cell phone everywhere and have a list of people to call (including 911) if you have an emergency. Yes, this means taking your phone with you on early morning trips to the bathroom. There are four basic types of medical alert systems. Classic base-station speakerphone models are speakerphones that sit on your counter and are activated by a button on your wrist or around your neck. Mobile medical alerts are self-contained speakerphones (usually smaller than a cell phone) that you carry around with you. They work wherever you have a cell signal (ATT or Verizon, depending on equipment). MobileHelp’s hybrid home and away system. Hybrid home and away systems have both the base station for when you’re home and a mobile unit for when you’re out of the house. No-fee medical alerts are different because they don’t call a monitoring center. Instead they call a pre-programmed list of your family and friends. There are a lot of medical alert companies. Most companies offer very similar equipment, especially in the classic base station models. There’s more difference in the mobile medical alerts offered by different companies. But the big difference usually comes down to the policies the companies offer. 30 day money back guarantee or 3-month lock in? Long term contract or month to month? Pre-pay to get a better monthly rate? Are pre-payments refunded if you cancel? Summary: You don’t want to buy just based on equipment, or just based on the company. It’ll be a combination of the features you need and the policies that make you comfortable working with a particular company. The answers to three simple questions will narrow down the type of system you should be looking at. Question 1: What’s your situation? Because of age or medical conditions you can’t get around well. You rarely leave your house, and when you do, it’s with a companion or caregiver. Your life is confined to just a few rooms of your home, and your home isn’t particularly large and doesn’t have multiple stories. Basic recommendation: the “classic” medical alerts that use a panic button on your wrist and a base station with a speakerphone are probably fine for you. Scroll down to see options, after the FAQ. You’re not homebound, but you’re not as active as you were decades ago, either. Maybe you’re gardening, walking in your neighborhood, going to doctors’ appointments, etc. You might or might not still be driving. But you’re probably feeling increasingly afraid of falling. You’re probably also limiting the activities you do so you don’t have an accident. You’re also in this group if you have a larger or multi-story home. Basic recommendation: If you’re in this group, a classic medical alert really isn’t right. Those are only going to protect you in a limited area. If you get one, you might find yourself further limiting your activities so you stay in the zone of protection. Not good. Instead, you’ll want to look at mobile systems or hybrid home-and-away systems. Or accept the tradeoffs of having a classic system. Scroll down to see options, after the FAQ. Except for some age- or medical-related stuff, you’re basically your same old self. You’re living what those obnoxious retirement folks call an “active lifestyle.” But you worry about getting help if you have an emergency when no one else is around, whether that’s at home or on one of your many errands. Basic recommendation: The classic systems are not for you. Look at mobile medical alerts, but make sure they’re actually better for you than the protection you already have through the smartphone you probably already carry. Scroll down to see options, after the FAQ. You’re getting older, but so what? Something could happen, but that’s always been true. If you have a fall, so be it. You’ll get through it like you always have, or maybe you won’t. In any case, you’re not wearing one of those damned fool gadgets. Question 2: What’s your budget? $30 a month. This puts you squarely in the sweet spot for most monitored medical alert systems without bells & whistles. $50+ a month. This gives you access to the feature-rich medical alerts with professional monitoring, as well as the widest range of mobile medical alerts. These systems have GPS tracking, automatic fall detection, and sometimes add-on services like activity monitoring and caregiver communication. Question 3: Will you use it? This question is particularly important if you’re looking for a medical alert for a parent or other relative. It’s one thing to own a system and have it plugged in and working. It’s another to actually use it. In order to use a system, two things have to happen. First, you have to wear or carry the button. Second, you have to be willing to press it if there’s a situation where you need help. Hard to believe, but some people who have paid for service are reluctant to use it because they don’t want to bother anyone. Or they’re afraid an ambulance will come screeching to their door and embarrass them. But the bigger issue is the first one. Some people just aren’t willing to carry around their medical alert panic button. For some it’s forgetfulness. For others it’s because they don’t like the way the button looks. Or they don’t like the way it makes them feel. If you know for sure you won’t be happy owning, wearing, and using a medical alarm, please stop reading this page and go do something you love to do. It’s okay not to want a medical alert. You don’t have to let anyone push you into it, whether that’s a well-meaning son or daughter or a pushy salesperson. It’s your life to live the way you see fit. If you’re shopping for someone else, like a parent, please make sure to involve them in the decision. It’s easy to convince yourself that if you just get it, they’ll come around to reality and start using it. Chances are, it’s you that needs to face reality. If you force the purchase, your chances of success are low. Same goes if you manipulate the person into saying yes. There are countless stories of people (reluctantly) agreeing to have a medical alert purchased for them and then never even taking out of the box. Or leaving it on the nightstand. When you’re talking with your parents, give them the option to say No and respect it. That way you give them the ability to say yes for real. The next section contains common questions people have about what medical alerts cost, how to install and test them, and things to watch out for when you make a purchase. How much does a good medical alert system cost? It varies, and paying more doesn’t always get you a better product. With most monitored systems, your monthly cost is partly a lease payment for the equipment and partly a fee for the monthly monitoring (though it’s never separated out). Some systems allow you to purchase the equipment and just pay for monitoring. Other systems work without a monitoring center so there’s no ongoing cost after you pay for the equipment. Figure $30 a month, but you can get good systems for $20 a month if you pay in advance and you can spend over $50 for something that’s not very good. How do emergency responders get in if my door is locked? Do they break it down? If emergency responders can’t get into your home and they think you’re in trouble inside, they’re allowed to force their way in. That’s why it’s such a good reason to have a key in a lockbox. You just give the code to the monitoring center when you set up your service. Then if they need to send emergency help, they will give the code to the dispatcher. Much better for EMS to use a key than break a window that will sit open while you are in the hospital! Why do some websites recommend systems that aren’t very good? Most websites that review and recommend medical alarms are “affiliates” of the companies, which means they get a payment if you click through and make a purchase. These amounts range from $50 to $85 per purchase. Sadly, there’s a big incentive for these sites to send you to the company that pays the biggest commission or the on that is best at pressuring you into a sale. What guarantees and cancellation policies should I look for? Many companies offer a 30-day money back guarantee so you can try the unit in your home and see if it will work for you. But don’t assume everyone does, because many companies don’t. As for cancellations, choose a company that makes it easy. With most providers, you need to call them to cancel, but they don’t stop billing until they’ve received all of the equipment back. Look for companies that don’t charge cancellation fees and that return any pre-paid months of service you’re not going to use. Above all, avoid long term contracts if you can. What’s so bad about a long term contract for a medical alarm system? Long-term contracts are unnecessary for medical alert services. Companies that have them claim they protect you against price hikes and guarantee good service, but if you think about it, that’s a stretch. A company that locks its customers in for 3 years doesn’t have any incentive to provide good service. In contrast, a company that allows you to cancel anytime and even refunds any pre-paid months has to provide great service all the time to keep earning your trust. Monthly prices for medical alerts have been quite stable for the past decade and will probably continue in the same range. What hidden fees should I worry about when buying a medical alert system? For the most part medical alarm companies are good about not using hidden fees. Generally there’s no charge to activate your system and no charge to use it to call for help. Just make sure you understand the monthly fee, what happens if your equipment gets damaged, and how the company handles cancellations. What about add-ons and upsells? Companies are very different when it comes to add-ons and upsells. For example, it’s common for companies to try to sell you a lockbox so emergency responders can access a key to your house. At a hardware store this is a $15-$25 item. Many companies offer it to you for $29. This might be worthwhile to you to save a trip to the hardware store. However, other companies ask you to pay monthly. At first this might seem like a deal, but $4/month for a lockbox quickly turns into over $100 (in about two years). Great for the company; not so much for you. The same pricing happens with things like extra pendants, wall buttons, etc. Does Medicare pay for medical alerts? In some states, financial assistance may be available for senior alert systems. Be sure to talk to the company you’re interested in to see if they can help you with this. But by and large you should assume the cost will end up coming out of your wallet. What can go wrong with a medical alert system? By and large the equipment is reliable and durable. Panic buttons can get lost or damaged. But the most common problem, especially with hybrid or mobile medical alerts, is that your battery runs down. People sometimes experience delays in reaching the monitoring center. In my experience most test calls I’ve made have been answered promptly, but it’s not instantaneous. This is another reason it’s good to test your system frequently. Phone outages or cell signal problems can also cause problems. How do I install the medical alert system? Medical alert systems are easy to install. If you have ever set up an answering machine, you can certainly do this. With base station units, you just plug it into the wall and plug in your phone line. Testing is easy. Just press the button. The system will dial the monitoring center. When the agent answers, just let them know it’s a test call. You should test your system at least once a month. The agents don’t mind, really. Is automatic fall detection worth the extra cost? It depends. Fall detection generally costs about $10 a month extra. The advantage is that if you happen to have an accident where you fall and hit your head or go unconscious, emergency help will still be sent. These kinds of falls are rare, but medical alert companies make extra money by convincing you to worry about them. The downside of fall detection is that there are false alarms. Some people get frustrated by the false alarms and stop wearing their pendant. Another downside is that fall detection pendants are larger than ones without fall detection. This also makes them more likely to be left on the bedside table. Does it matter where the call center is located? Not really, as long as it’s in the same country as you are. Some companies try to make a big deal of the fact that their call centers are in the USA. I’ve never heard of any reputable medical alert company serving American customers that has call centers outside of the USA. It can be helpful for a company to use 2 separate centers in case there’s a problem with one, but it’s not essential. Which is better, a company-owned monitoring center or a contract monitoring center? There probably isn’t that big a difference, except in the minds of the companies who have their own monitoring centers. A company-owned center has tighter control over quality, but they are solely responsible for staffing, so if they’re trying to cut corners they might not have enough operators if there’s a spike in demand. Contract centers serve multiple companies, so they can respond to spikes in demand from one company or region more easily. Some contract centers have higher training requirements for agents than company-owned centers. Which medical alert systems should be avoided? Avoid systems with long term contracts. On the “no-fee” side, I strongly discourage you from getting one of the low-priced systems that does not actually allow you to talk to the person on the other end. Yes, these exist! They play a recorded message to the friends and family on the call list. Way too many things can go wrong. Also think carefully about a no-fee system that doesn’t have two-way communication through the pendant. Remember, with a monitored classic system they know what to do if they can’t hear you. But your friends and family are not trained responders, so clear communication is key. Classic medical alerts consist of a button you wear on your wrist or around your neck and a base station that is plugged into the wall. Depending on design, the base station uses your land line phone or a cellular connection. The advantage of these systems is that they are very simple. Once the unit is plugged in, it just works. As long as you have the button with you, you press it and the base station dials the monitoring center. The buttons are lightweight and not bulky. The disadvantages are primarily to do with the speakerphone. Depending how far you are from it when you fall, you may not be able to hear the person at the monitoring center, and they might not be able to hear you. If you are outside, for example, the unit may still respond, but the monitoring center won’t know what the problem is. Heart attack? Or just a simple fall where all you need is a neighbor to come help? This can slow down getting the right response. Confusion about “range” – Companies advertise ranges of 450 to 1300 feet. This is the activation range, not the range at which you can actually talk with the monitoring center. Best for people who are basically home-bound. If that’s you, these units are your most affordable option and require no planning or thought on a day to day basis. No batteries to charge, for example. If “home-bound” doesn’t feel like you, consider one of the other types of systems farther down the page. Overview: If you’re looking for a classic medical alert, it’s hard to go wrong with this unit from Bay Alarm Medical. Great rates, multi-lingual service, money back guarantee, and if you need to cancel, your prepaid months are refunded. If you don’t have a landline, a cellular unit costs $14.95/mo extra. Free monitoring for your spouse when you buy an extra button. Cost: $27.95/month ($20/mo quarterly, $20/mo semi-annually). Semi-annual option includes free ground shipping and free lockbox. Battery Life: 5 years for button, 24hrs for base station. When the button battery gets low, they send you a new one, free. Guarantee/Cancellation: Risk free 30-Day trial period starting from when the unit arrives. Prepaid months refunded. If you pay quarterly or semi-annually, your prepaid months are refunded if you cancel. (This makes pre-payment a risk free way to lower your monthly cost.) No cancellation fees; billing stops when the unit is received by the warehouse. Overview: The QMedic is a modern, well-designed speakerphone system, good for home-bound people. It works with a land-line or cellular connection and has added features like activity tracking and automated alerts. There’s no long term contract, but if you buy pre-paid months at a discount, you don’t get that money back when you cancel. Guarantee/Cancellation: If you pay quarterly or annually, your prepaid months are not refunded if you cancel before the term is up. 30-day money back guarantee beginning when you first test the system. No cancellation fees; billing stops when the unit is received by them. 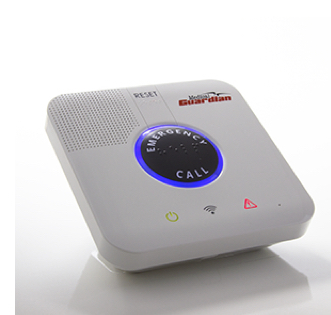 Overview: The Classic Guardian from Medical Guardian is a basic home based speakerphone unit that works with a land line. Its cousin the Home Guardian is basically the same unit but with a cellular connection. A solid system from an established company. Notes: This unit is also available in a package called “Family Guardian” for $79.95/month; this includes activity monitoring and caregiver tools. Overview: The Cellular Classic is a cell-based in-home system with affordable accessories. It does not need a land line. The wrist buttons are a big more attractive than most. This does not provide any protection away from home. Guarantee/Cancellation: Return the system at your expense to cancel service. Service will be cancelled effective the day the returned equipment is received. You will receive a pro-rated refund for unused service that had been prepaid. Overview: A basic “classic” medical alert with waterproof panic button. Sold by EMS Sentry. Additional buttons can be purchased to cover more people in the home. Notes: MediVoice is different than many companies in that you purchase the equipment outright instead of leasing it as part of your monitoring fee. Your payback period on the purchase is about 24 months. So if you keep the system longer than that you start to see the savings on your monthly charge. If you keep it for less, it’s actually more expensive to buy outright than to lease at a higher monthly charge. (Based on typical $30/mo fee for lease and monitoring bundle.) The call center uses certified EMTs. 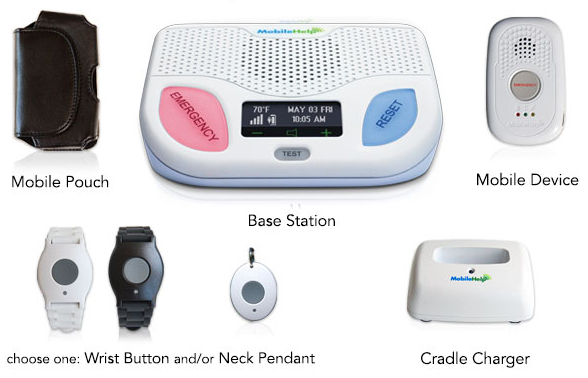 Overview: LifeStation offers a version of the classic medical alert with a small waterproof pendant and base station speakerphone. I’ve marked them down from 3 start to 2 stars because they were cagey on the phone about how their refund process works, and described it in a way that would create the wrong impression for many people. LifeStation does not offer refunds of any kind. If you don’t have a landline, you can get a unit with a cellular connection. Guarantee/Cancellation: No money back guarantee. You can cancel with 30 days’ notice. This basically means you’re committing to at least 2 months to try it out. Note: Add on items like lockboxes or extra help buttons are charged monthly. This can really add up. You might end up paying over $100 for a lockbox you could buy at the hardware store for less than $20. Overview: Basic equipment, high prices, aggressive phone salespeople, long term contract. Guarantee/Cancellation: No guarantee, no refunds. You are locked into a 3 year contract. Note: A lot of review sites give LifeAlert a high ranking. This may be because LifeAlert pays a very high affiliate commission if a website refers a customer to them. 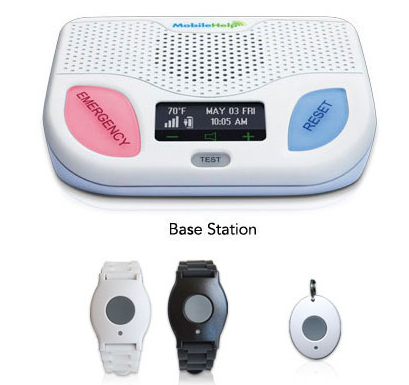 Many other companies sell classic base station medical alerts. These include Guardian Medical Monitoring, Acadian On Call, Walgreens Ready Response, One Call Alert, Medical Care Alert, Senior Safety, Rescue Alert, Phillips Lifeline, Alert 1, LifeFone, CVS, and countless others. Most would get 2 or 3 stars. Talk-through-the-pendant medical alerts are home based systems that try to fix the big flaw in classic medical alerts: limited communication range. Instead of talking (or shouting) through a speakerphone that might be in a different room, with these systems you can talk and listen right through the pendant. There’s still a base station plugged into your wall, but you don’t have to be near it. The advantage of these systems is that you can communicate with the monitoring center much more easily. For example, if you are outside working in the garden or taking out the garbage, you will be able to hear and talk just as if your pendant was a phone. The same goes if you are in the bathroom with the door closed and the water running. Good luck being understood on a speakerphone that’s at the other end of the house! These units are also great if you live in an area without good cell service. The disadvantage of talk-through-the-pendant designs is that the pendant is bigger than the panic buttons used on classic medical alerts. You can’t really wear it as a watch. Some people don’t like having it around their neck. Others put it down and forget to put it back on. …but who feel vulnerable in and around their home. If that’s you, these units are more affordable than most mobile medical alerts (the GreatCall Lively being the big exception) and provide much better protection for active folks than a classic medical alert. But they don’t protect you when you’re more than a few hundred feet from home. If this feels restrictive, consider one of the other types of systems farther down the page. Overview: This solid performer from EMS Sentry has a base station that plugs into your regular phone line and a small pendant you carry around with you. When you have an emergency, you can talk directly through the pendant. Additional pendants can be ordered to cover more people. Battery Life: Not specified. Pendant uses rechargeable batteries. Hybrid medical alerts are home based systems that also have a mobile medical alert as part of the package. At home you wear a regular wrist button or neck pendant. Lightweight, simple, great battery life. If you have an emergency you press it and talk to the monitoring center through the base station. Outside the house, you carry the mobile communicator button with you. Most are smaller than a deck of cards. The mobile buttons connect to the monitoring center by cell signal. Most have GPS to help responders find your location. The advantage of these systems is that you get complete coverage. At home you have “set and forget” convenience with the simple base station. Out in the yard or out on the town, you have a mobile system that protects you anywhere. The disadvantage of these systems is that you have to keep switching systems when you go out and come back home. Some people take off their wrist buttons when they go out. This is fine, but then they need to remember to put them back on. and who feel vulnerable not just at home, but when they’re out as well. Your other option, of course, is to get a fully mobile medical alert and just carry it everywhere, at home and away. MobileHelp’s Cellular Duo is a hybrid home and away system. Overview: The Cellular Duo from MobileHelp is two units in one. The first part is a classic medical alert with panic button. The second is a GPS enabled mobile unit which you can carry with you out of the house. Cost: $41.95/month. $39.95/mo paid quarterly and $36.95/mo paid semi-annually. Free shipping and free activation on most plans. Guarantee/Cancellation: Return the system at your expense to cancel service. Service will be cancelled effective the day the returned equipment is received. You will receive a pro-rated refund for unused service that had been prepaid. Risk free 30 day trial period. Notes: This unit is billed as the best of both worlds. It’s nice at home to have a simple wrist pendant and speakerphone unit, as long as your house is small. And as long as you remember to take your larger mobile unit with you when you leave, you have great protection. (The problem could be remembering, though.) Once nice thing is that the wrist/pendant button activates both the plugged in base station AND the mobile unit. In effect, you have two base stations, which could help prevent dead spots in your house. Overview: The Mobile Guardian from Medical Guardian is an interesting offering that provides both home and on-the-go protection with a wrist button and a portable base station. The picture says a lot: when you’re home, you put the GPS mobile unit on its charger and it acts like a regular base station (you wear a decent looking wrist or pendant button to activate it). When you leave the house, take the unit with you in your pocket or purse. The wrist or pendant button can come with you, or you can leave it at home if you don’t like the look of it. Cost: $39.95/month. Get two months free with an annual payment. Notes: This is basically the same system the Cellular Duo from MobileHelp, listed above, except you don’t have the regular plug-in base station. As long as you always remember to bring your portable unit home and charge it, you’re getting just about the same coverage. But if you leave it in the car, or don’t take it out of your jacket pocket, in 1 day the battery will run down and you will be left without any way of using your panic button until you find it and recharge it. Mobile medical alerts do not have a base station. Your complete system is contained in a pendant that you carry with you at all times, in the house and out of it. The advantage of these systems is that you get complete coverage, as long as you have a strong cell signal where you spend time. The disadvantages of these systems are twofold. First, the pendant is larger than the panic buttons of classic medical alerts. So you have to figure out how you’re going to carry it all the time. Second, you have to remember to recharge the unit regularly. Some need to be recharged every day, some just once a month. If it’s recharging, you’re not carrying it! As long as you’re comfortable carrying it and set up a good routine for charging, these devices can be a reliable solution. 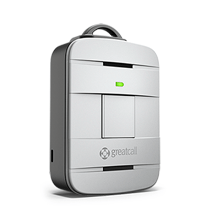 Overview: Affordable and well-designed, this unit is sold by GreatCall, a company that aims to empower rather than infantilize it’s customers. Includes GPS and optional fall detection. Comes with options for several levels of monitoring at different price points. Works on the Verizon network. Cost: $19.99/month for base plan. Preferred is $24.99/mo and Ultimate (with fall detection) is $34.99. The device costs $50 and has a $35 activation fee. Notes: GreatCall has several plans. The entry level plan includes just their 5Star service, and it’s one of the most affordable medical alert service plans available, mobile or otherwise. For a few dollars more per month you add their Urgent Care and GreatCall Link services, which allow you to speak with a nurse on demand and allow caregivers to access information about how the device is being used to get a sense of your health. For another upgrade, you get device replacement if it gets damaged and also fall detection. GreatCall owns and operates their own call center. Overview: The Active Guardian is a top of the line mobile medical alert with an impressive 5 days of battery life. It works on the AT&T network, finds your location through GPS and WiFi (more accurate than just GPS), and has optional fall detection. Cost: $49.95/month. Get 2 months free if you pay annually. No-fee medical alerts do not call a monitoring center. Therefore there is no monthly monitoring fee. Once you buy the system, there’s nothing else to pay. The advantage of no-fee medical alert systems is that you don’t pay a monthly fee. Your initial cost may be higher ($150 to $300), but after that, it’s free to use for as long as you want. Another advantage some people cite is privacy. Because you’re not giving medical information or the code to a lockbox to a monitoring company, your privacy may be better preserved. Personally this doesn’t seem like a big deal, but if it is a big deal for you then a no-fee alert is definitely a better option. Disadvantage: Will you get the help you need? The disadvantage of these systems is that you’re depending on untrained people to help you in an emergency. Plus, you don’t know who you’re going to get. Or if anyone will be available to help. Once someone answers, you’re depending on them to send the right kind of help when they probably haven’t had training in emergency response. If you need a medical alert but can’t afford an ongoing monthly expense, no-fee alerts are your next best option. Overview: The Freedom Alert from LogicMark is the best of the no-fee alert systems. It has a two-way pendant that works up to 600 feet from the base station. Works with land lines or VOIP. You can program up to 4 numbers plus 911. A switch on the back lets you set the unit’s behavior: 1) Call up to 4 contacts. 2) Call up to 4 contacts then 911 if no one answers. 3) Call 911 directly. Cost: $279.95 one time purchase price. Battery Life: Rechargeable lithium ion battery in pendant lasts approximately 6 months. Low battery warnings. Base station has 24-hour battery for power outages. Guarantee/Cancellation: Check with the store where you purchase it. Note: One nice feature of this unit is that if you reach someone and they really think you should be talking to 911 right away, they can actually dial 911 into their phone while your call is live. That will instruct the unit to hang up and dial 911 without you having to do anything. Then you can speak to 911 directly. Overview: The Guardian Alert 911 from LogicMark is a no-fee medical alert that just dials 911. It has a two-way pendant that works up to 600 feet from the base station. Works with land lines or VOIP. Cost: $149.95 one time purchase price. EXCELLENT POST Confusion about the LIVELY. Verizon or AT&T? Through Great Call or its own company. ? Pretty sure it’s Verizon. GreatCall owns the Lively product line. It was a different company but they sold it to GreatCall. This is one of the best sites ever.